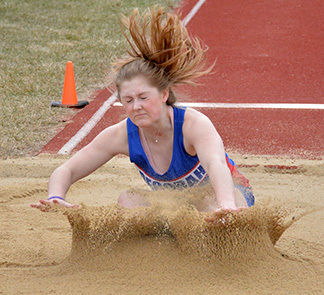 It was top-notch competition at the Hudson relays as Decorah finished third with 94 points. Solon won the title with 108, followed by Mount Vernon with 100. Brielle Buresh won the 100-meter dash in 13.07 seconds. The lone relay to take first was the 4x100 in 51.01 seconds. Members of the winning relay were Grace Syverson, Brooke Berns, Rose Gullekson and B. Buresh. Garnering seconds were 4x200 and sprint medley relays. Receiving individual bronze medals were Jordyn Hussain in the discus, Leila Johnson in the 1500-meter run and Annette Leschensky in the 3000-meter run. At Waukon, Decorah put up 54 points. Four events finished in third place beginning with Ashley Schneberger in the high jump, clearing 4 feet, 10 inches. Asha Merritt had a time of 29.60 in the 200-meter dash, good for third. Jenna Lundtvedt, Hallie Busta, Sarah Mumford and Alexis Svestka had a time of 2:05.13 in the 4x200 to earn bronze. With a time of 57.37, Svestka, Anya Lovstuen, Busta and Merritt took third in the 4x100.